The evil 'Burka bombers of Baghdad', shown here with detonator. Did you hear the one about the exploding Iraqi women? BAGHDAD - Female suicide bombers killed 72 people in attacks blamed on al Qaeda at two popular Baghdad pet markets on Friday, the city's worst attacks in six months, dealing a blow to Iraq's hopes that security is getting better. Police said a female suicide bomber killed 45 people and wounded 82 at the Ghazil pet market in central Baghdad. Another blast 10 minutes earlier killed 27 people and wounded 67 at a bird market in southern Baghdad, police said. You were expecting a joke? Truth be told, it is a joke, and a sick one at that. No one likes to be treated as a fool, but no one minds when they have no idea they are being treated like a fool. Provide any person on the planet with the details of this story and they'll scowl and nod sagely, completely oblivious to the fact that what they take as reality is in fact utter fantasy, manufactured and spoon fed to them by the US military and mainstream media respectively. Palestinian suicide bombings? Yes indeed, no doubt about it. Attacks such as those that occurred at the Baghdad pet markets today are no longer big news, they happen so regularly and are so blindly accepted by all that there is no longer any need for any investigation, not that any objective reporting or reporters are allowed anywhere near the sites of these "suicide bombings". It is enough for the Western press to just parrot the statements of unnamed "witnesses" or US military officers or Iraqi puppet police, always "on condition of anonymity because they aren't authorized to release the information." Today Iraqi puppet police claimed that "a female suicide bomber killed 45 people and wounded 82 at the Ghazil pet market in central Baghdad, and another blast 10 minutes earlier killed 27 people and wounded 67 at a bird market in southern Baghdad." Iraqi President Jalal Talabani weighed into the disinformation campaign claiming that the attacks were committed by terrorists "motivated by revenge" who wanted to show that they are still able to stop the march of history and of our people toward reconciliation." One witness said the female bomber entered the market saying she had birds to sell. Scores of people gathered and then the bomb underneath her clothing went off. Lieutenant-Colonel Steve Stover of the U.S. military said both attacks were "caused by female suicide bombers" and blamed "Sunni Islamist al Qaeda in Iraq". "By targeting innocent Iraqis they show their true demonic character" he added. Of course, if as claimed by the US military and Iraqi puppet government officials the perpetrators of these brutal attacks are Muslim terrorists, they must truly be demonic, possessed by demons even, because the is no trace of any logic or reason in their attacks. Consider the claim of Iraqi puppet president Talabani that the perpetrators are motivated by "revenge" and want to "show that they are still able to stop the march of history and of our people toward reconciliation." Revenge against whom exactly? Ordinary innocent Iraqi Muslims, both Sunni and Shia, who hate the American occupation of their country as much as anyone? Islamic "terrorists" in Iraq, both "al-qaeda" and others have made it clear that their grievance is primarily against the 150,000 US troops that are currently illegally occupying Iraq. How do we explain then why an Islamic terrorist organisation in Iraq would use the indiscriminate murder of Iraqi civilians as a viable way to achieve their aim of expelling the foreign occupying forces? Clearly the ONLY result of such attacks is to bolster the US government's claim that it must remain in Iraq to fight the terrorists "over there" rather than be forced to fight them "over here". Obviously we are dealing with truly demonically possessed people or some arm of the US, British or Israeli governments and military is covertly ordering the attacks in order to justify the continued foreign occupation of Iraq. Getting back to the exploding Iraqi women today; it seems that there is good reason to suspect that these women (and the other few dozen who were blown to pieces) may not have been willing participants in the attacks, that is to say, all those who died were unwittingly "suicided" by some other party. Major-General Qassim Moussawi, spokesman for the Iraqi military in Baghdad, tells us that both suicide bombs were detonated remotely by mobile telephones. "We found the mobiles used to detonate the women"
Now let's just think about this for a moment. First of all, this suggests that the women did not have control over the bombs they were allegedly carrying. Why not? If they were indeed gripped by some vengeful fervor against ordinary Iraqis, and willing to sacrifice their lives to "stop the march of history and of [the Iraqi] people toward reconciliation" why would they not have been allowed to choose the best time to detonate their explosives in a crowded market place? Secondly, how in the name of Yahweh could anyone claim to have found the mobile phones used to detonate the explosives? There were likely dozens of people at the market carrying phones, none of which would be identifiable as the phones that detonated the explosives. Furthermore, if the phones were on the women's bodies, they they would surely have been blown to pieces along with the market-goers. Contemplating the good Major General's unbelievable claim of crime scene evidence, I am immediately reminded of the claim that the passport of alleged Flight 11 hijacker Satam Al Suqami, that he was supposedly carrying when he the plane stuck WTC 1, was later miraculously found in almost pristine condition on a sidewalk hundreds of yards from the point of impact. The mystery deepens when we read that some unnamed Iraqi puppet police officer initially said that the bomb at the market was hidden in a "box of birds" and that only later was it determined to be a "suicide attack". Why the change in story? Well, the 'damning evidence' that made this yet another case of exploding Iraqi women was that a head, somehow determined to be the exploding Iraqi woman's head, was found at the scene. Supposedly someone sifted through several heads and other body parts belonging to the dozens of victims before deciding on the best fit. Explosives are covertly placed in an area prior to a scheduled gathering of Iraqi civilians. An unknown party observes the scene from a distance. At a point where a significant number of people have gathered around the area of the hidden explosives, and when a new shopper enters the area, the unknown party remotely detonates the explosives (possibly by mobile phone signal). There is no need for any actual suicide bomber because that last person to move close to the area of the hidden explosives becomes, according to eyewitnesses, becomes the accidental "suicide bomber" reported by the mainstream media. Today it was two innocent women wearing burkas. The controversy over claims that Britain allowed two IRA informers to organise 'human bomb' attacks intensified this weekend. British Irish Rights Watch said: 'This month BIRW sent a confidential report to the Historical Enquiries Team on the three incidents that occurred on 24th October 1990... at least two security force agents were involved in these bombings, and allegations have been made that the "human bomb" strategy was the brainchild of British intelligence. The thirty years "dirty war" waged by British forces in Northern Ireland was a testing ground for the development of counter-insurgency (i.e. counter civilian) strategies, and the lessons learned there have served the coalition invasion forces well as they go about the business of dividing and conquering the people of Iraq, chiefly by way of mass murder and mayhem and the repeated use of the now ubiquitous unwilling suicide bomber. There is a saying of sorts that, if you are going to do something, do it well, and given the serious consequences involved, nowhere is that more true than when you plan to engage in criminal activity. Today in Basra, Southern Iraq, two members of the British SAS (Special Ops) were caught, 'in flagrante' dressed in full "Arab garb", driving a car full of explosives and shooting and killing two official Iraqi policemen. This fact, finally reported by the mainstream press, goes to the very heart of and proves accurate much of what we have been saying on the Signs of the Times page for several years. 1: The US and British invasion of Iraq was NOT for the purpose of bringing "freedom and democracy" to the Iraqi people, but rather for the purpose of securing Iraq's oil resources for the US and British governments and expanding their control over the greater Middle East. 2: Both the Bush and Blair governments deliberately fabricated evidence (lied) about the threat the Saddam posed to the west and his links to the mythical 'al-Qaeda' in order to justify their invasion. Coming not long after the botched London bombings carried out by British MI5 where an eyewitness reported that the floor of one of the trains had been blown inwards (how can a bomb in a backpack or on a "suicide bomber" INSIDE the train ever produce such an effect), more than anything else today's event in Basra highlights the desperation that is driving the policy-makers in the British government. British intelligence would do well to think twice about carrying out any more 'false flag' operations until they can achieve the 'professionalism' of the Israeli Mossad - they always make it look convincing and rarely suffer the ignominy of being caught in the act and having the faces of their erstwhile "terrorists" plastered across the pages of the mainstream media. 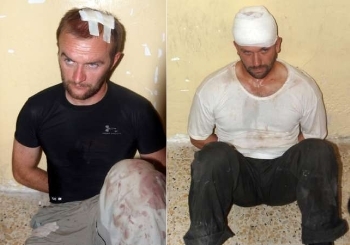 The REAL face of "Islamic Terror" - Two SAS agents caught carrying out a false flag terror attack in Basra, Iraq September 20th 2005. BAGHDAD, Iraq -- A British armored vehicle escorted by a tank crashed into a detention center Monday in Basra and rescued two undercover troops held by police, an Iraqi Interior Ministry official told CNN. Iraqi security officials on Monday variously accused the two Britons they detained of shooting at Iraqi forces or trying to plant explosives. Photographs of the two men in custody showed them in civilian clothes. When British officials apparently sought to secure their release, riots erupted. Iraqi police cars circulated downtown, calling through loudspeakers for the public to help stop British forces from releasing the two. 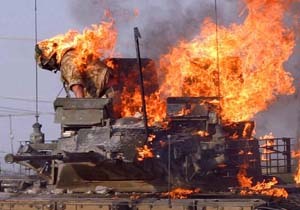 Heavy gunfire broke out and fighting raged for hours, as crowds swarmed British forces and set at least one armored vehicle on fire. Witnesses said they saw Basra police exchanging fire with British forces. Sadr's Mahdi Army militia joined in the fighting late in the day, witnesses said. A British military spokesman, Darren Moss, denied that British troops were fighting Basra police. Iraqi police detained two British soldiers in civilian clothes in the southern city Basra for firing on a police station on Monday, police said. "Two persons wearing Arab uniforms opened fire at a police station in Basra. A police patrol followed the attackers and captured them to discover they were two British soldiers," an Interior Ministry source told Xinhua. The two soldiers were using a civilian car packed with explosives, the source said. He added that the two were being interrogated in the police headquarters of Basra. The British forces informed the Iraqi authorities that the two soldiers were performing an official duty, the source said. British military authorities said they could not confirm the incident but investigations were underway. Official Iraqi sources subsequently claimed that one of the women was mentally retarded and the other had an "unspecified birth defect", and that it is likely that neither was aware that they were being used as proxy bombs by the "demonic militants". The mention of the exploitation of the mentally retarded to serve a political or military agenda immediately reminds us of another event in Israel in 2004 where a 14 year old Palestinian boy was apparently set up by Israeli intelligence to play the role of a budding suicide bomber. See here for the details on that one. Great psychopathic minds also think alike it seems. Then again, with so many Israeli "military trainers" in Iraq, perhaps there is a single mind behind both of these events. Speaking from Washington Condi Rice opined that the attacks "show the reality of the continuing struggle against militants", and that "Iraqis have turned against these terrible, violent people in their midst who will do anything." Can someone please bring Condi up to speed and inform her that the Iraqi people turned against the "terrible, violent people in their midst" back in 2003 when the US military illegally invaded their country. Since then, over 1 million Iraqis have paid the ultimate price in their resistance of imperial tyranny. Captain Ken Masters was a military investigator in Basra and involved in an inquiry into what the two British soldiers were doing when they were apprehended. He was found hung in his quarters in October 2005, five days before the end of his tour of duty. The MOD said suicide, although there was no note and no evidence of suicidal tendencies. I too just heard on the radio that they now have morphed the story, so that the women were now mentally retarded. That reminded me of the story from March 2004, when the IDF got caught using a 14 year old mentally retarded Palestinian boy as a suicide bomber, by offering him $20 to wear a belt. See: Israel's 14 year old bomber stunt backfires and Israel 'fabricated' child-bomber story. More damming evidence to who the perpetrators of this attack in Iraq is, though more evidence is hardly needed. Thanks Joe. It's disturbing that this 'alternate reality' where muslims gets blamed for suicide bombings actually exists in the minds of millions of people. Thanks to the movies, and to repeating the lie verbatim for years now, it seems people have just passively accepted it. It's so sad, especially considering all the evidence that shows it is always the third party, wether its the US, Israel or Britain who committed the crime. All that taken together gives us the ability to look at 9-11 in a completely new light. Hopefully the masses will catch on before it's too late. Recently I watched a video of the Doha debates with George Galloway and some ex-Cia guy. When it came time for questions there was a man (I think from Jordan) who talked about Condaliza Rice's use of the term "creative chaos" and asked about the possible involvement of the CIA in suicide bombings across Iraq. After squirming a little, the CIA guy repeated the tired old line of "if only it were so, that would show some competence in the U.S. govn't". How can some many people believe such a huge lie? Read the first reports of this bombing last night and thought, "here we go again..". Reminds me of the scene in V for Vendetta when the publican asks one of his customers, "Can you believe this sh**?" Without an understanding of organised psychopathy, the "suicide bomber" will continue to be a powerful emotional tool of the PTB, in maintaining the belief that "they" are different from "us". there are no words to describe just how sick this whole thing is. Thank you Joe for laying it out in stark clarity. This is essential reading for anyone who is remotely interested in the current psycho-political reality. God this is so horrifying. And precisely because it is so horrifying, people refuse to consider the extensive calculated intent that goes into planning and executing 'random' human bombs like this.